Edie Evans, circa 1915, Toronto, Ontario, Canada, digital image. Original in possession of Kathryn Hogan, Windsor, Ontario, 2003. 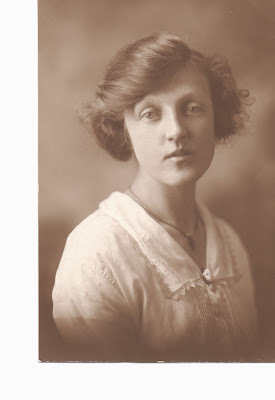 The family story about Great-Aunt Edie remaining a spinster all her life was told to me as a young girl. The reason Edie Evans never married was that she had been engaged to a "Whitehouse cousin" but he had died in the First World War. Who was this cousin? When and where did he die? What happened to him? I started researching Edie's story a number of years ago when I was looking through a box of family heirlooms. Inside the box was a poster from the Walsall Pioneer, a newspaper from our family's hometown in England. On the poster were pictures of enlisted men from Walsall and surrounding area who had died, been wounded, been killed or were missing in action. One of those men on the poster was Lce.-Cpl. W.H. Whitehouse, died of wounds, Warwicks, (42 Walsingham -street), and beside his name was an "X" marked in black ink. Aha! He must be the Whitehouse cousin to whom Edie was engaged. Supplement to Walsall Pioneer, 23 Sep 1916, Walsall, Staffordshire, England. In possession of Kathryn Lake Hogan. 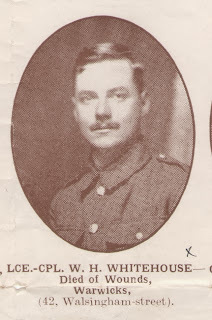 A bit more researching in my family files and online revealed Lance-Corporal William Harold Whitehouse was the son of Thomas Howard Whitehouse and Alice Gertrude Crutchley. Bill had been born about 1888 in Walsall, Staffordshire, England. In 1901, the family had been living at 77 Walsingham Street. Bill has served in the 2nd Battalion of the Royal Warwickshire Regiment. He had died 15 September 1916 in France & Flanders. At the time of Bill's death, Edie Evans was just shy of her twentieth birthday. Last month, I was alerted to a new database of records that had recently became available on the UK Government website at https://probatesearch.service.gov.uk/ These are wills that had been made by soldiers who had died in the Great War. A search for William Harold Whitehouse returned a positive match indicating he had made a will. I ordered the will. his wife and child. WHAT?! Wife and child??? Yes, his wife. Gertrude Matilda Whitehouse. Whoa. Wait a minute here. He was a married man? I guess so. The executor of the will was Bill's father, Thomas Howard Whitehouse. The will was dated 23 May 1916. 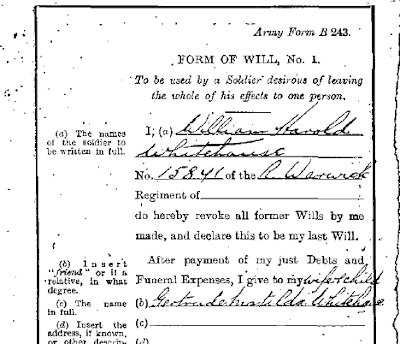 Will of William Harold Whitehouse, 1916, digital copy. A quick search on Free BMD and I found an indexed marriage entry. Yes, a man named William E Whitehouse [italic emphasis added by me] had married a woman named Gertrude Allum. The marriage had been registered in the December Quarter of 1916 in Birmingham. Okay, that makes sense, since the Warwickshire Regiment was based out of Birmingham. 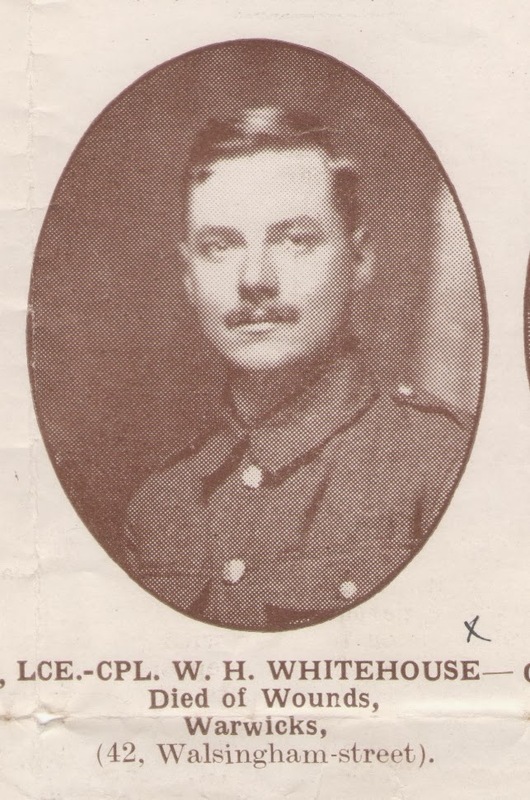 But wait a minute..."my" William Whitehouse had died in September 1916. If this was the same man, then why was the marriage not registered until the last three months of 1916? I don't know. I need to order that marriage certificate. What about Edie? Did Edie know? Did Edie know Bill had married another woman before he died? I don't know. And, unfortunately, there isn't anyone left to ask.